The Horizontal Pec Press 308 Junior traditional movement is a favorite among young first time strength training students. The wide bottom pad narrows nears the user’s chest thus providing both stability and a comfortable range of motion. . Resistance is adjustable. Protective covering on cylinders ensures the safety of all users .Elementary model is powder coated in Fire Red while the junior sized model is powder coated in a deep brilliant Purple. Portable wheel system makes it easy for instructors to store units and/or reconfigure fitness circuits. Call 1-800-875-9145 to speak with one of our fitness advisors with any questions you may have. How do we put a price on our kids overall wellnes and their future - Go to FitnessZone.com today to order the Horizontal Pec Press 308 Junior and let's give our kids the advantage they deserve. 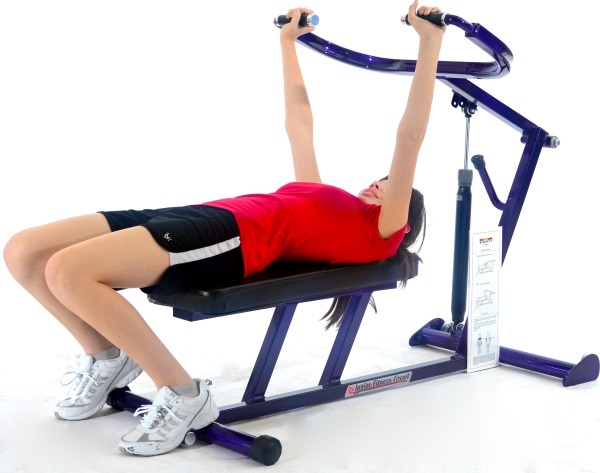 Order your Horizontal Pec Press 308 Junior from FitnessZone.com today!